At the Sofitel Hotel Melbourne you get it all: spectacular location, understated luxury, comfort and elegant dining. It is one of Australias most luxurious five star hotels with spectacular views over Melbourne. Located in the Paris end, the East end of Collins Street, it is close to prestigious shopping, dining and entertainment venues. It is a large hotel with fabulous reviews. And, on its higher levels, it provides an even more luxurious experience. You can top it off with still more breathtaking floor to ceiling views, exclusive accommodation and service, and a private 35th floor lounge. For secure bookings and guaranteed best prices, you can book the Sofitel Melbourne here - No Reservation Fees! Within the Sofitel there are two elegant restaurants with Londons John Savage the 5-star Executive Chef, as well as a bar for connoisseurs of cocktails and culture. It also has a sophisticated ballroom and conference venues for your special events. 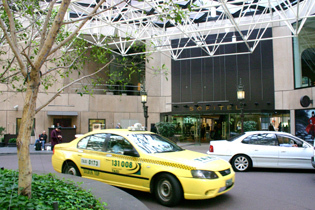 The Sofitel Melbourne on Collins sponsors a range of art organisations. It regularly exhibits shows of temporary design, craft, photography, painting and drawing. These change throughout the year and some of the works are for sale. The Sofitel is one of the places where you can take traditional Afternoon Tea, or High Tea, in Melbourne. On individual tiered stands, you can enjoy delicate finger sandwiches, cakes, freshly baked scones with home made jam and whipped cream, or hot and cold savouries and pastries, accompanied with a glass of sparkling wine and tea or coffee. Prices for Melbourne Australia Hotels vary according to the season and Melbourne events. Discounted prices, way below a hotel rack rates (standard rate), are available over the internet. You can make a booking for good deals and last minute Melbourne hotels here.